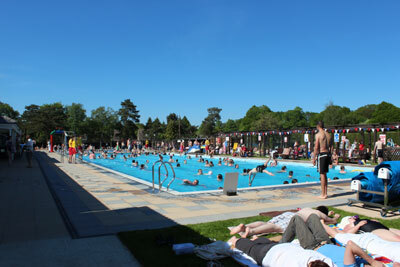 Jubilee Park is a very popular destination for locals and visitors alike, especially in the summer months when the heated outdoor swimming pool is open. Other park amenities include a camping and caravanning site, children's playground, picnic area, bowling green, croquet lawn, cricket field, putting course, tennis courts and a cafe. The park is located on Stixwould Road in the heart of the village, a gift from Sir Archibald and Lady Weigall to commemorate the jubilee of King George V in 1935. 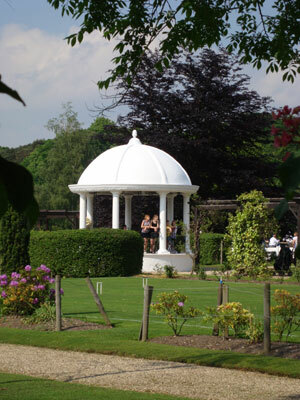 The amenities are set in traditional English gardens with a bandstand, pergolas and pathways adorned with English roses. A great place for a picnic! The park returned to local management on the 1st of April 2011. Jubilee Park Management Committee was set up by the Parish Council and is supported by the 'Friends of Jubilee Park'. At the end of the 19th century the land now occupied by Jubilee Park was part of a golf course. Golf was first introduced to the village in 1890 and was played on land behind Tattershall Road. 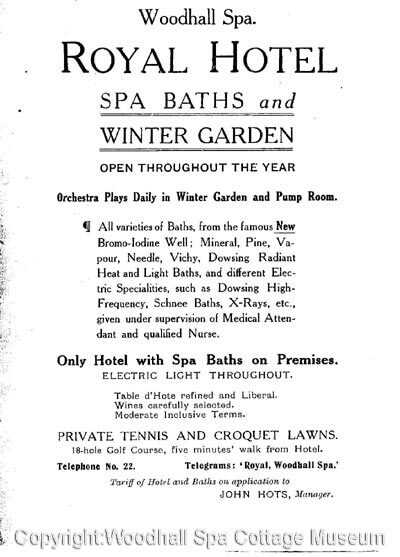 However, this ground was soon required for building in this increasingly popular Spa and on Wednesday 22nd May 1895, the first day`s play on a new links was celebrated. This second, 9 hole, course consisted of 60 acres of land, with the first tee near where the Kinema stands and it extended over the present Petwood gardens and across Stixwould Road. The last 5 holes were on land which is now Jubilee Park. Then, near the beginning of the 20th century, Squire Hotchkin offered many acres of land in order to build an 18 hole course. The official opening of this was in June 1905. It is the present, famous, Hotchkin Course. Meanwhile, in that same year, the Baroness von Eckhardstein bought land on which to build her Petwood House. Some of the land was on the other side of Stixwould Road – the present park. After divorcing the baron, Grace married Capt. (later Sir) Archibald Weigall and for many years they enjoyed a Society lifestyle at Petwood. Then, in February 1933, it was reported that the house was to be turned into a hotel. This was partly to benefit the village, for the Spa had never recovered from the burning down of the grand Victoria Hotel, 13 years earlier. The Weigalls were thinking of the village in other matters also. At this time the land which is Jubilee Park was a rough grass field. Lady Weigall thought of transforming it into gardens and a leisure area. In 1935, King George V and Queen Mary had been on the throne for 25 years and Lady Weigall thought this was a wonderful occasion on which to open her new recreation grounds. Consequently, she asked her friend, Princess Marie Louise, a grand daughter of Queen Victoria and frequent visitor to the Spa, to perform the opening ceremony, marking the Jubilee of the monarchs. The event was reported in the local newspaper on 4th May 1935. “Her Highness was handed a golden trowel in a case of Jubilee blue.” She spread mortar on the commemorative stone and pronounced “To the glory of God and the healing of the sick, I declare this stone well and truly laid.” At her request, Rev. Harvey, vicar of Woodhall Spa, then gave a prayer, after which the Princess said, “I now name these grounds Royal Jubilee Park.” The ceremony concluded with the singing of the National Anthem and three rousing cheers for Sir Archibald and Lady Weigall and their daughter, Priscilla. In the evening the Lincoln British Legion band played in the bandstand of the new Royal Jubilee Park. However, this new block was not built and the foundation stone, laid by Princess Marie Louise, can now be seen low on the wall of the cafe which faces Stixwould Road, in the park. In September of the same year in which the park opened there was a gift from Lincoln Services Club of a 3 bay set of swings for the playing field and over the next 12 years the park and its amenities were improved and enjoyed by residents and visitors alike. Although the Weigalls no longer owned Petwood they were frequent visitors over the years. However, after the war, with commitments elsewhere, they decided to offer the park as a free gift to the village. The Council realised the generosity of the gift but had to consider the cost of the upkeep of the park and on 13th July, 1946, a sub committee was formed to estimate the annual liability. Over the next weeks there was considerable correspondence in the newspaper regarding costs and the possibility of the gift necessitating an increase in rates. On 10th August a referendum on the desirability of accepting the offer was held and on 7th September the result was published. It was 592 people in favour of acceptance and 92 against. The grand occasion of the handing over of Royal Jubilee Park, which was done from its bandstand, was on Whit Monday, 1947. Sir Archibald commented that it was a happy coincidence that it should take place on the 80th birthday of Queen Mary, after whose Jubilee with that of her husband, the park had been named. He said that the land on which the park stood had been “transformed” by his wife 12 years previously, in the same way as she had transformed “the land across the road” (Petwood) 35 years ago. She had thought of providing this land as “a centre for recreation and repose for the inhabitants of Woodhall Spa and the surrounding district and it was done.” He hoped that the local authority at Woodhall would not regard the park as income earning, primarily but to give young and old the opportunity for real enjoyment. Col. Hotchkin spoke of the benefit to the village of having its own park with tennis and swimming and the cricket ground and a place where fetes and entertainments could be held. He pointed out that the land could easily have been sold for building development and thanked Sir Archibald and Lady Weigall for their “magnificent gift to Woodhall”. After the speeches there was a tennis tournament, a cricket match against Forest Amateurs, a Beauty Competition and an Ankle Competition! 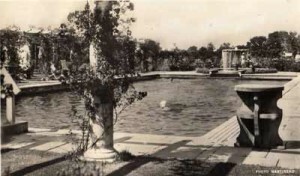 There were various side shows, the swimming pool and cafe were open, a concert party performed at regular intervals and in the evening a dance was held. A later report prosaically announced that a profit of £200 had been made! The trail can be started at any location, but we suggest you also visit the Cottage Museum to see the photographs taken by John Wield during the heyday of the Spa and items associated with this unique Victorian Spa town. The Trail is just one of several projects in the hands of the Woodhall Spa Parish Council sponsored Heritage Committee. Click here if you are interested in the committee or their projects. 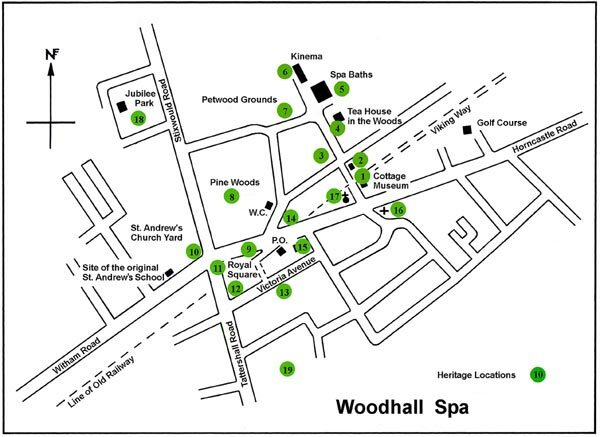 How well do you know Woodhall Spa?